Tens of thousands of volunteers and donors comprise the work of the American Red Cross. While they’re all amazing individuals, occasionally there’s a person who presents a challenge to us all when considering just how much we really are capable of giving. Southern California’s Desert to the Sea Chapter has one such financial donor and volunteer serving on its local Board. Shishir Shah became a donor to the American Red Cross many years ago for one simple reason. “I found that time and time again, whenever there’s a disaster anywhere in the world, the Red Cross is always the first to respond,” said Shah. After retirement, he did not have to look hard for meaningful work to occupy some of his newly found time. As a USC graduate with a masters in computer engineering, he considered ‘getting dirty’ with the Red Cross. It didn’t take long for Shah to find himself deployed as a disaster relief volunteer, working a two week stint in the middle of a hot and humid Texas summer. Shashir has also volunteered during the Blue Cut Fire in San Bernardino. He worked a shelter, organizing the feeding program and was once again struck by the thankfulness of the evacuated families. Once a month, Shah becomes the Orange County Red Cross Disaster Duty Officer . Throughout a full weekend, and for the non-office hours of the week, he is the ‘go to’ person on-call for any home fire call. When that call comes, it’s his responsibility is to mobilize the appropriate levels of Red Cross assistance. Shah recounts one experience in Santa Ana when two apartments burned to the ground. A man who had lost everything but the clothes on his back came to talk with him. The man explained he worked in a nearby nursery, and shared an intimate moment with Shah. Volunteers like Shashir is what allows the Red Cross to respond to disasters both big and small. For more information on becoming a volunteer click redcross.org/volunteer. 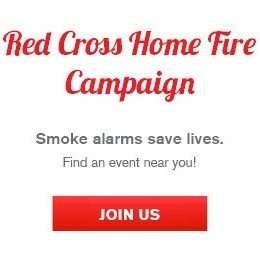 Previous Home Fire Campaign comes to Santa Ana!